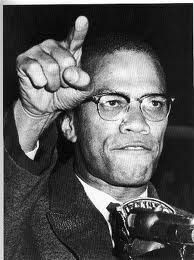 Below are more quotes by Malcolm X. All the true heroes who stood up for justice were hated by many. MLK, Joan of Arc, Malcolm X, Gandhi, the list goes on. Don't give up. With guys I revere, like Marcus Garvey or Malcolm X, their look is less about style than purpose and the expression of beauty. It wasn't just about being noticed, you know? Happy Black History Month. Everyone should try and learn about at least one African American daily...not just Martin Luther or Malcolm X.